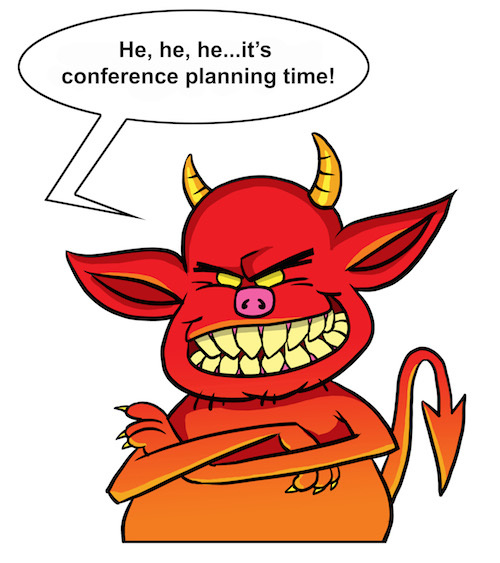 The Devilish Details of Small Business Event Planning - Mischa Communications, Inc. Mischa Communications, Inc.
Hosting a conference to showcase your small business is a fantastic idea, but it’s certainly no easy task. From the earliest developmental stages to the arrival of the big day itself, the devil truly is in the details – and what a demanding devil he is! Fortunately, there are three things that can make (or break) your next small business event: planning, planning and more planning. Here’s the scoop on how to make your event a rousing success. A knock-their-socks-off small business event isn’t planned overnight, so the biggest favor you can do yourself (and your business) is to start fleshing out the details early. From the venue to the speakers to the guest list, you’re in for a pretty big time commitment. And trying to do it all with an angry clock ticking over your head won’t just lead to stress – it’ll also lead to a shoddy conference and less-than-impressed (possibly ex) customers. Your budget is a pretty important part of the planning process. Spend too little and you’ll underwhelm your attendees; spend too much and you’ll offset any potential sales that come from the conference. Calculate the true cost of your venue, rental equipment (chairs, tables, audio-visual equipment, etc. ), refreshments and speaker fees and travel expenses. Be realistic about what you can afford, cut corners where you can and never ever count on the conference “paying for itself” in terms of increased sales. This is something so many small businesses assume, but very few actually seem immediate sales results. Instead, the dividends tend to be paid months and even years later. We’ve all been to one of “those” conferences. You know the ones – a boring speaker reading from his notes, a slideshow of equally boring stuff and food that’s worse than your elementary school’s cafeteria. Don’t be one of “those” conferences. You want to educate people about your small business, sure. And you want to convert their interest into a sale. But what you don’t want to do is bore them to tears. Put a little life into your event. Have a bit of fun. Change things up. Whether it’s a local comedian doing a five-minute bit to open the conference, a local band playing music during cocktail hour or some cool door prizes, an entertained audience is a happy audience. And happy audiences have been known to spend money! The devil may be in the details, but he can be exorcised with a good plan. Take your time, mind your budget and give the audience something to talk about on the way home. Still need some help? Drop Mischa Communications a line and let us help you plan the conference of the year…or at least the month!